Caracas (AFP) - Venezuela's opposition leader Juan Guaido refused Friday to rule out authorizing US intervention to force President Nicolas Maduro's hand in allowing in humanitarian aid and leaving power. Guaido launched an audacious bid to oust Maduro last month, declaring himself acting president, a move recognized by the United States and some 40 countries, including 20 from the European Union. National Assembly president Guaido told AFP he would do "everything that is necessary... to save human lives," although he acknowledged that American intervention is "a very controversial subject." Guaido, 35, is trying to bring in aid from the US but the supplies are stuck in warehouses in Colombia because the Venezuelan military has blocked their entry. "Venezuela won't allow the spectacle of fake humanitarian aid because we're no one's beggars," Maduro said at a press conference in Caracas. Venezuela frequently suffers from power cuts, a lack of running water and public transport, while there is also a shortage of doctors and medical supplies in hospitals. But bringing in humanitarian aid is crucial to Guaido's challenge to Maduro's authority. 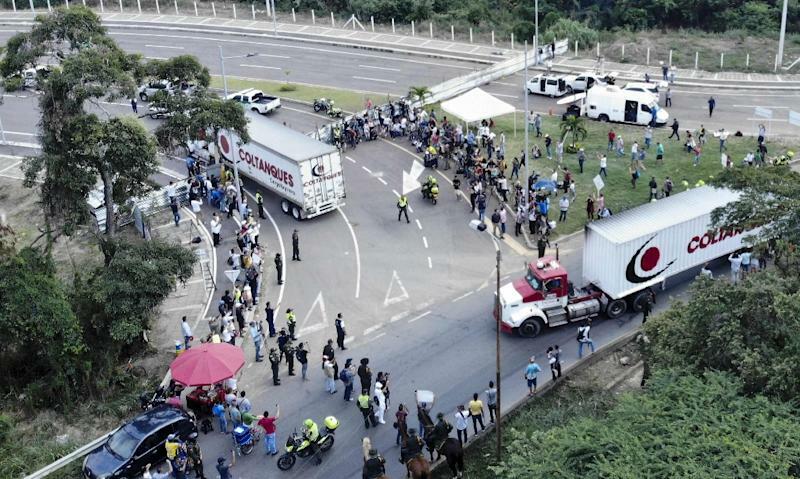 Several trucks carrying food and medicine arrived at a collection center in the Colombian border town of Cucuta on Thursday. Venezuelan migrants gathered there to see if they could receive some aid. However, on the other side of the Tienditas border bridge, Venezuelan troops loyal to Maduro had blocked the road, heightening tensions with Washington. Guaido, who has appealed to the military to back him, said the armed forces "have a dilemma: either they side with the people in need or with the dictatorship." Maduro, 56, blames shortages of food and medicine on US sanctions, which mostly target regime individuals as well as state oil company PDVSA. "Liberate the money that has been blocked and sequestered," said Maduro, who has repeatedly accused the US of fomenting a coup. 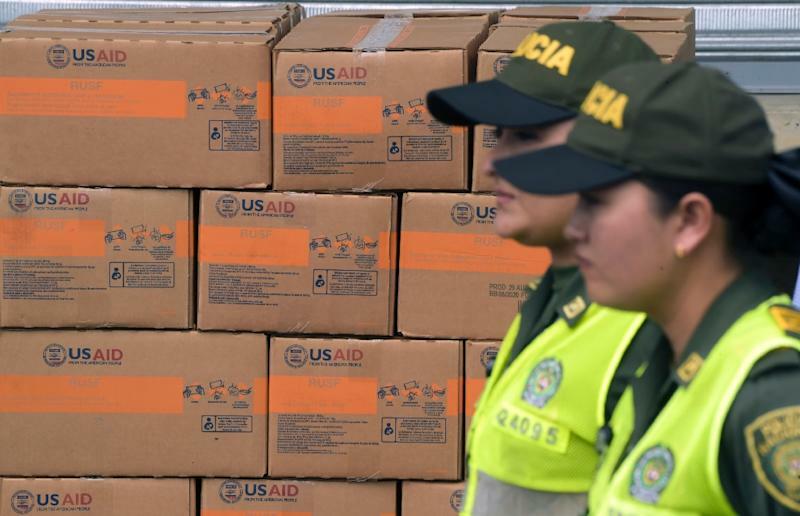 Guaido's representative in Cucuta, Lester Toledo, said the provisions already delivered were the "first drops" and promised "a tsunami of humanitarian aid" would follow. "We're going to open a humanitarian corridor and the doors to freedom," he told journalists. Early Wednesday, a Venezuelan military boat carrying 100 tons (tonnes) of aid landed in Havana to help Cubans recovering from the wrath of a tornado. 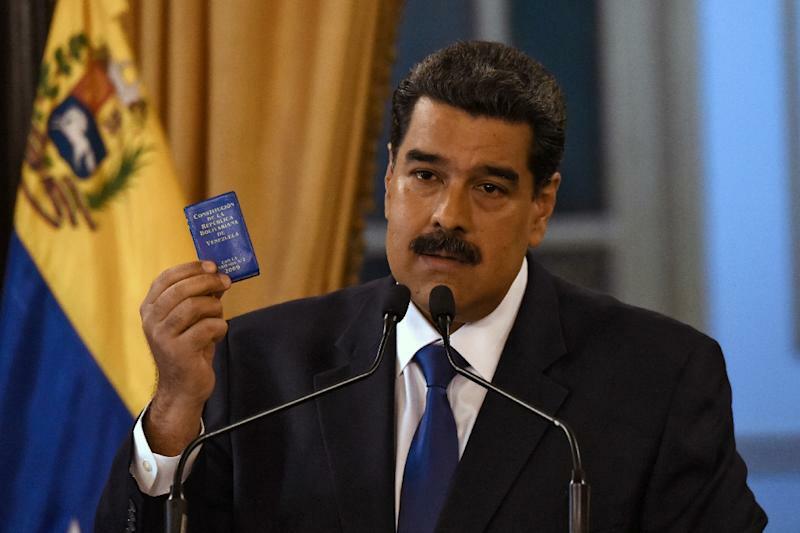 He claims his legitimacy from the constitution, but Maduro -- labeled a dictator by the West and his Latin American neighbors -- insists his re-election last year was constitutional. "We'll do everything we have to in a sovereign and autonomous manner to end the usurpation, (establish) the transitional government and (hold) free elections," said Guaido. Consultants Eurasia Group predicted on Thursday that Maduro "will be unable to sustain his regime." The socialist leader hit out at European and Latin American ministers who, after meeting in Uruguay on Thursday, urged Maduro to let in aid and called for a new presidential ballot. The International Contact Group urged "free, transparent and credible presidential elections" in Venezuela "as soon as possible" to find a peaceful solution to the power struggle between Maduro and Guaido. Maduro, who last weekend rejected an EU ultimatum to organize snap presidential elections, fumed: "You don't listen to the truth in Venezuela. You're deaf... They've taken extremist positions." He did welcome the Contact Group's proposal to send a mission to Venezuela, though. The Contact Group chided Maduro over the deaths of 40 opposition protesters last month and told him to respect "the country's institutions, particularly the democratically elected National Assembly."